Knorr Soup ? Is it Really A Healthy Choice? Knorr Soup: Contains- corn flour, refined wheat flour (maida! ), dehydrated vegetables or chicken shreds, vegetable fat, salt, sugar, glucose syrup, spices & condiments, (some varieties also contain certain vegetable powder, soy sauce powder, yeast extracts and milk in some form), as well as emulsifiers, acidity regulators, flavour enhancers, and thickeners. Homemade soups: Contains- fresh veggies or chicken, spices and condiments of your choice, salt, sugar, a little maida or whole wheat flour or corn flour or potato starch, and lots of water or veg broth or chicken broth. The list will be much shorter (than the commercial soups), but surprisingly, the taste would be yummier! Knorr Soup: Commercial soups say "100% Real Vegetables and Chicken, No added MSG, No Added Preservatives" on their packets. Homemade soup will say much more... It will not only say "100% Real and Fresh Vegetables and Chicken" but also, "No added emulsifiers, No added flavor enhancers, No added acidity regulators". 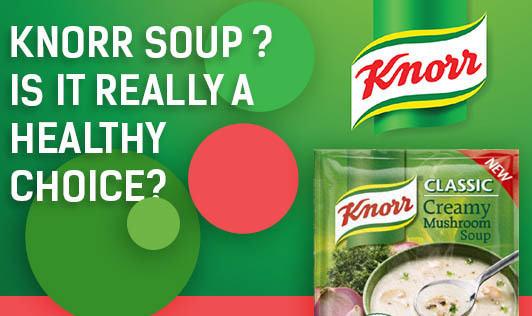 Knorr Soup: How much nutrition do you get from those dried vegetables? The process of dehydrating can significantly reduce the nutritional content of vegetables. The nutrients which are mainly affected during this process are vitamin A and C, as well as certain B complex vitamins. Homemade Soup: Contain fresh vegetables and no added preservatives or acidity regulators. As these soups required no commercial processing, therefore, the nutrient loss is minimal as compared to the commercial soups. Hence, homemade soups are really healthy than commercial ones. As we all know, lesser the processes done on a food, the better it is for health! These kinds of packed foods can be chosen once in a while when cooking is not convenient. But to pick it every time you go to a supermarket, will not be a good choice. If you really want to get all the nutrients from the food which you consume so frequently, I would definitely serve you a homemade soup with fresh vegetables! Enjoy a fresh bowl of homemade soup every time you think of eating healthy this winter! Choose Natural... Choose Better Health! !